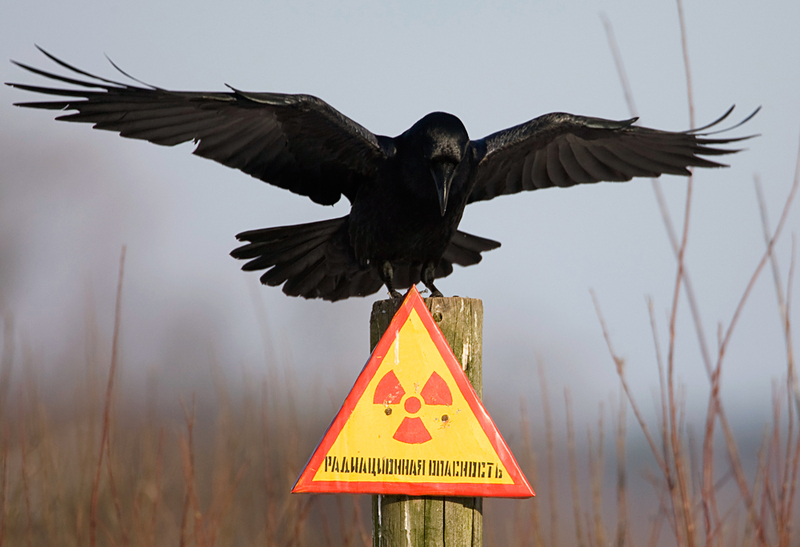 A raven stretches its wings as it sits on a post inside the 30 km (18 miles) exclusion zone around the Chernobyl nuclear reactor near the village of Babchin, some 370 km (217 miles) southeast of Minsk, December 23, 2009. The sign reads: "Radiation hazard"
Three decades have passed since the disaster occurred at the Chernobyl nuclear power plant. Once rising towns, Chernobyl and Pripyat, in close proximity to the nuclear power plant, are today ghost cities. Before I began my journey, I had to find an agency that provides tours to The Exclusion Zone. Under existing law, privately arranged visits are not allowed and a permit to enter The Zone is provided only to people who work on the construction of the sarcophagus and to individuals who work on securing The Zone itself. For us ordinary people, the only way to enter The Exclusion Zone is with one of the permitted agencies, ones authorized by the government. There is the possibility of taking an individual tour (more expensive option) or a standard one (larger number of passengers). The cost varies going from 60 - 300 €. An additional factor that affects the price is the language. You can choose either English or a Russian tour. Being fluent in the Russian language, I choose the cheaper option, the Russian one (tours in English are about 30 % more expensive). The date of the booking is also important. If you book your visit a month earlier, you get a 25 % discount. After paying for my tour, the only thing left was to wait for one of my longest dreams to come true. To finally see The Exclusion Zone - Pripyat, Chernobyl and the notorious reactor number 4. The danger level in The Zone is not high, but some precautionary measures are still advised, mostly about clothing. The biggest problem are contaminated particles which can spread through the air (especially during summer fires) or in the soil. I bought a set of clothes and shoes exclusively for the trip in a second hand shop, which cost me $15. I came to Kiev the night before my departure. It was a cold and snowy morning, shrouded in gray colors of the sky. The weather was exactly what I had envisioned. The Zone is located around 110 km northwest of Kiev, a car drive of around an hour and a half. I was tired and fell asleep, only waking up as we were approaching The Zone. Snow covered scenery and the grayness of winter followed us throughout the trip. Arriving at the Dityatki checkpoint, we were able to see the first radiation warning signs. Crossing that checkpoint was like crossing through a veil and penetrating into a different world. A straight road ahead of us was covered in a thin layer of snow that was being dispersed by a cool breeze. Even that road did not leave an impression of an ordinary snow covered road, but rather a path that paved a way into that different world. Staring at it, a movie called ‘Stalker’ came to my mind. Directed by one of the most famous Soviet directors, Andrey Tarkovsky and inspired by the novel written by the Strugatsky brothers, it was filmed seven years before the Chernobyl disaster. It depicts a man called "stalker" who leads two people into The Zone, a place where supposedly the biggest dreams, those conscious and subconscious, come true. There they search for happiness and the meaning of life. Buildings began to emerge as we were approaching the big sign that read "Chernobyl". Those buildings left an impression of a town, but the feeling of vastness did not disappear. Yet, while entering that small town, which is almost uninhabited, those feelings were even more pronounced. While driving through it, we could see the architecture and its facade that at a certain perspective looked well kept, but it was obvious that time had taken its toll. At the very centre, we are welcomed by "Angel with the trumpet", a monument to commemorate the tragedy of the world’s worst nuclear disaster. Behind it lies a symbolic graveyard, in which tombstones represent all the places that vanished after the nuclear disaster. As we enter the main town street, on our left we see a store that happens to be open with not too many products on the shelves, basic things and some souvenirs for the tourists. We continue driving through the remnants of this once small, prospective town, passing down the road that leads us again into the forest. In plain view are reactor number 4, never completed reactors 5 and 6 and an enormous sarcophagus which protrudes on the horizon. As we get closer to the heart of the tragedy, the nuclear power plant becomes bigger. In the middle of the nuclear power plant area there is another monument. This one is dedicated to the tragically killed employees of the nuclear power plant. Right behind it, exactly on opposite sides, are situated reactor number 4 and a big sarcophagus under construction. Finally, we continue towards Pripyat, a town whose name remains least mentioned in this tragedy, but a town that suffered the most. It disappeared overnight, along with most of its young population. The town has stayed trapped in time and only nature around it continues to grow.